From Left to Right: Leslee Unruh, Alpha Center Founder; Luanne Christensen, Life 96.5 Midday Host; Erica Miller, Alpha Center Executive Director. 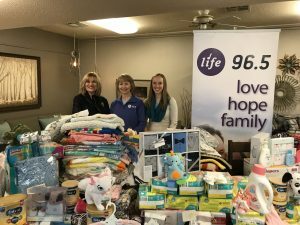 Life 96.5 Radio listeners donated hundreds of new baby items valuing thousands of dollars to help fill the Baby Boutique for young moms choosing life for their unborn babies. The Baby Botique is located at the Alpha Center in Sioux Falls. Thanks to local business partners Lewis Drug Stores and AMaVo Women’s Apparel and Lifestyle, over 1,300 beautiful new baby necessities will be filling the shelves and making a difference locally for women cared for by the Alpha Center staff. Among the blessings received are 167 packages of diapers, 117 packages of baby wipes, 110 onesies, 103 blankets, and several larger items like strollers, pack-n-plays, a crib, and a changing table.